Thursdays from 6-8 p.m. starting April 19 th. League play will continue thru July, 2012. 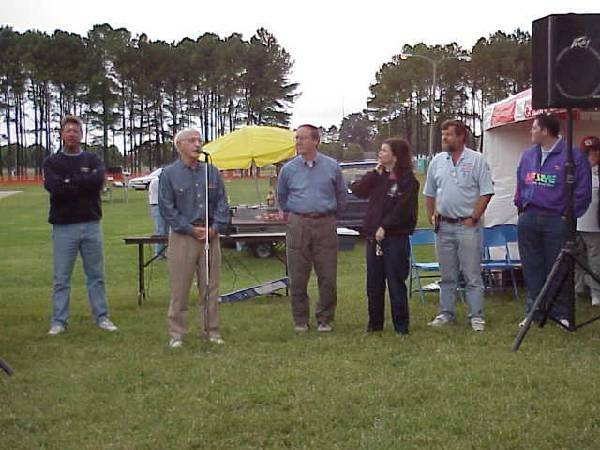 On Saturday, March 17, 2001 at City Park in Chesapeake, an organizational meeting for a new horseshoe club was held. The meeting was advertised in the paper and a mailing went out to former members of the Portsmouth Horseshoe Club. Several people showed up, and that was enough to get the ball rolling. Kirk Adams was voted in as President of the new club. With a hopeful starting date of April 1st for the club league start up, a major challenge exists - as of the day of the meeting, the club has a single court to pitch on. Kenny Stuart (Chesapeake Parks & Recreation Dept) said they would do whatever was necessary to get 4 more courts by the 1st. The club decided to hold their league play on Sunday afternoons at 2:00. Kevin Snelgrove (RD) has been working with Kenny Stuart throughout the winter organizing the Chesapeake Open Horseshoe Tournament which will be held Sept. 29. Both felt it would be in the best interest of the City and the VaHPA if a local club were to help host the event. We apprecaite the efforts of Allen Krasnoff for coming up with the idea and the effort and help Kevin and Pat Snelgrove, Kenny Stuarts, Shelly Pope, Bobby Clifton and many more people who have made this possibe. Thank You all. Directions, From I-64, Take Exit 289(500 Greenbriar Parkway) south, go past the malls 2 miles from the interstate, go past Greenbrier middle school and turn right onto Greenbriar Road and as you enter the park the courts are on your left as you drive in.